You can even make this on a weekend and indulge a bit👌🏼 …flavours of kasuri methi along with saunf (fennel) & the tang of chaat masala makes for a great palate pleaser! Equipment: a non-stick pan/ tawa, measuring cups/ spoons. Marinate the paneer with the ingredients mentioned above except the oil and keep it aside for 15-20 mins. After 20 mins, sauté the marinated paneer in 2 tbsp oil for 5 mins in a pan/ tawa. Set it aside. Next, add 1 tbsp oil to the remaining oil in the pan, once it’s hot enough, add the jeera & saunf seeds. Let these crackle for a few seconds. Then add the chopped onions, chillies & garlic paste. Cook until the onions turn golden. Do try it out soon….you will love the flavours! And it also goes very well with some Wholewheat Tawa Naan or Methi Makka Roti👌🏼🤗..however is served with some plain Parathas this time around as my hubby wanted to have them. This definitely is something that you will want to have again and again…🍽🍛 and really easy to make too! Equipment: a pan, measuring cups/ spoons, ladle. Make a smooth purée of the tomatoes & soaked cashews without adding any water. Set it aside. Heat oil in the pan, add all the whole spices, jeera & hing. Let them splatter for a min. Then add the chopped onions & chillies. Cook until they onions turn golden. Then add the purée, turmeric, degi mirch, coriander pwd & ginger-garlic paste, stir well and cook until the raw smell goes away. The paste will start leaving the oil around the edges once it’s cooked. Next, add the cabbage, capsicum, carrot & peas. Season with salt and mix well. Cover & cook until the veggies are soft. That takes about 7-10 mins on medium flame. Then add the cream and garam masala. Mix well. If needed, you can add some water to correct the consistency. Let it cook for about 5-8 mins. Finally add kasuri methi & lemon juice. Stir well & garnish. Serve with Rotis/ Parathas. Rasgulla happens to be one of my personal favourites when I am thinking of Indian desserts👌 They are so light…spongy & not at all heavy on the palate. 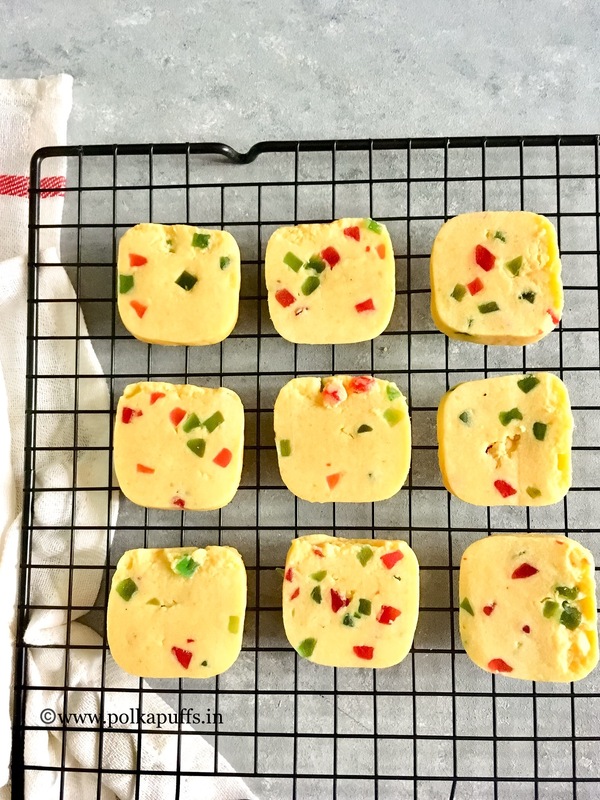 These were never on my mind…not exactly something I was planning to make, but then…milk splits early one morning & it just pops into mind to give these a go! Looked up some recipes online..and found a really easy recipe & some tips for a first timer like myself😉…but I have adjusted the quantity of sugar as per our liking. Equipment: a large plate, a pressure cooker, a ladle, extra bowls, measuring cups/ spoons. Please note that the milk had already split in my case. But to split the milk specially to make these…heat the milk in a large pan, once it comes to a boil, add the citric acid pwd and stir once. The milk will split. Just strain the milk solids in a muslin cloth and wash the solids within the cloth under running water to get rid of any traces of citric acid. Keep the milk solids in the muslin cloth under some weight for 30 mins to remove all the whey. Then transfer the cottage cheese/ paneer on a plate. Mash the paneer with the your hands until it’s soft and a little greasy in texture. Next, divide the mashed paneer in equal parts…about 7-8 and make smooth, crack free balls. Set them aside. Now, add water and sugar in the pressure cooker. Turn the flame on and let the sugar melt. Once the sugar has melted completely & the syrup starts boiling, add the balls one by one. Close the lid and place the weight too. Let it simmer for 10 mins on high flame. Then after the first whistle, lower the flame and let it simmer for another 5-8 mins. Turn off the flame after that. Let the pressure release on its own. Then take out the cooked rasgulla and the syrup and place them in a bowl to cool down completely. You can squeeze them and see how spongy they have turned out to be! They are ready…garnish & serve them chilled!! They taste really nice..and keep well for 2-3 days in the refrigerator. You can make these with full-fat milk too. The Kite Flying Season is here! The Harvest Festival or Makar Sankranti as known in most parts of India…or Lodhi in Punjab! It brings us such joy to celebrate this festival…😊 And it marks the beginning of Spring in India! Equipment: a non stick pan, a plate/ tray, a spatula, measuring cups/ spoons. Grease the tray and keep it ready. Heat ghee in the pan and the sugar. Let the sugar melt on low flame until it dissolves completely. Then add the cardamom pwd, sesame seeds & peanuts. Keep the flame low and mix everything very well. Turn of the flame immediately. Now pour this mixture on the greased tray quickly and spread it out a bit. Take a knife and make lines on the mixture if you want to have evenly shaped pieces later. Wait for the mixture to cool down..it will take about 15-20 mins. Then break it into pieces and store in an airtight container. It remains fresh for upto 2 weeks. Dal Makhani is everyone’s favourite dal when we are at restaurants or dhabas! ☺️ Rustic flavours with the robustness of Garam Masalas and the rich creaminess make it very irresistible. It’s our favourite too…specially when we visit our favourite Dhaba on the outskirts of the city. It tastes just heavenly with some rotis and sliced onions! That’s all…no need to complicate things! I have tried many recipe for dal makhani earlier too…but was never really satisfied with the outcome. Recently, when we were at this Dhaba again…I had the luck to find out a secret from the chef himself to make this dal taste absolutely divine! I couldn’t wait to come home and try it again! It tasted just like the one we ate at the Dhaba…so easy that I couldn’t believe I had finally made it just the way we loved it ☺️👌 although he didn’t specify the exact quantity of the ingredients but I had to adjust it according to the quantity I was making for us. Equipment: a heavy bottomed wok, a pressure cooker, measuring cups/ spoons. Soak the lentils for 6-7 hours. Then pressure cook them with 2 cups of water and some salt until they are soft and mushy. Approximately 6-7 whistles are enough. Let the pressure release on its own before you open the lid. Heat ghee & butter together in the wok. Then add the hing, cardamom, chopped onions, chillies & ginger-garlic paste. Cook until they are slightly golden and the raw smell goes away. (The chef’s tip of adding fennel pwd is what makes a lot of difference due to its earthy aroma & tasted like the one we eat at the dhabas). Then add all the masalas except Garam masala. Sauté well for about 5-7 mins. Then add the tomato. Season with salt & sugar. P.S. If you don’t have fennel pwd, you can make some by roasting it for a couple of mins just to heat it up…the colour mustn’t change and then grinding/ pounding it well. Everyone makes it either by cooking carrots with milk and letting the milk reduce…it takes almost 2-3 hours for this process to happen! Or some even add milk solids (Mava/ khoya)..this takes a little lesser time and the taste is awesome! But I cook my Gajrela with condensed milk as many people do. It’s faster and doesn’t compromise on the taste…it’s soft, moist & just melts in the mouth! Moreover, it’s instant😉😉…. My Mom had told me I could use condensed milk when I was making it for the first time post my wedding, I hadn’t been keen on spending a long time waiting for it to cook! So I have kept following the same method to cook this all these years…and it always works so well! Let’s get started..
Equipment: a heavy bottomed wok, a spatula, measuring cups/ spoons. Heat ghee in the wok, once it’s hot enough, turn the flame to low. Add the grated carrot, cook while you stir it constantly until it turns mushy and very soft…it must be about 90% cooked and takes approximately 20-25 mins. Then add the cardamom pwd & condensed milk and keep stirring until the condensed milk gets completely absored into the carrots & dries up well. Tutti Frutti Cookies/ Karachi Bakery style Biscuits are the best accompaniment to your tea or to share as edible gifts. Besides, these cookies are very famous in Hyderabad, originally baked in the city’s famous Karachi Bakery. Hence the name Karachi Biscuits. They are absolutely melt in the mouth good and so easy to put together. One can choose any colors of candied fruits. I prefer red and green. However, even golden-yellow is just as pretty or add some orange colored ones. The colors do not make any difference to the flavors but they sure look so pretty! 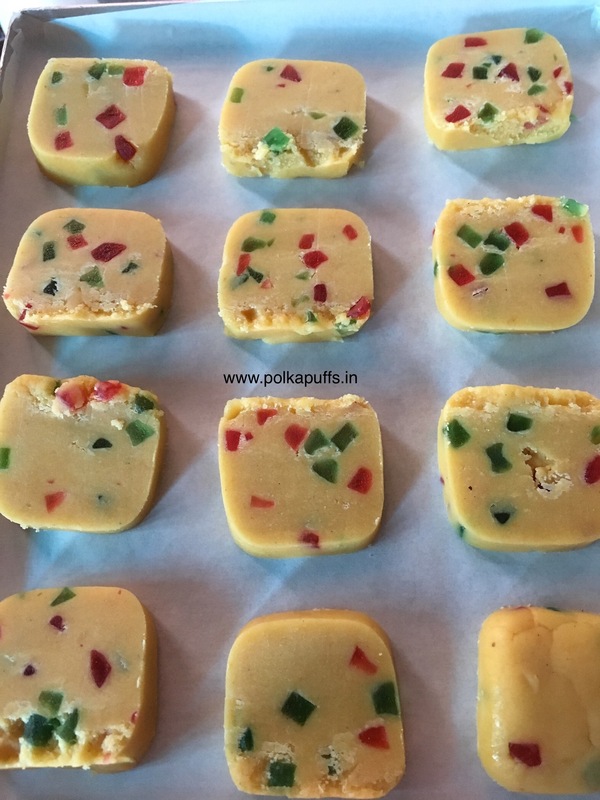 Tutti Frutti Cookies/ Karachi Biscuits are not difficult to make but many of my readers have asked me to share tips on how to bake these cookies to perfection, basically tips and tricks ensure that the cookies do not spread as they bake. In my last 3-4 years experience of baking cookies, I’ve perfected a few important, yet easy tricks that I follow to ensure that the cookies never spread as a rule! 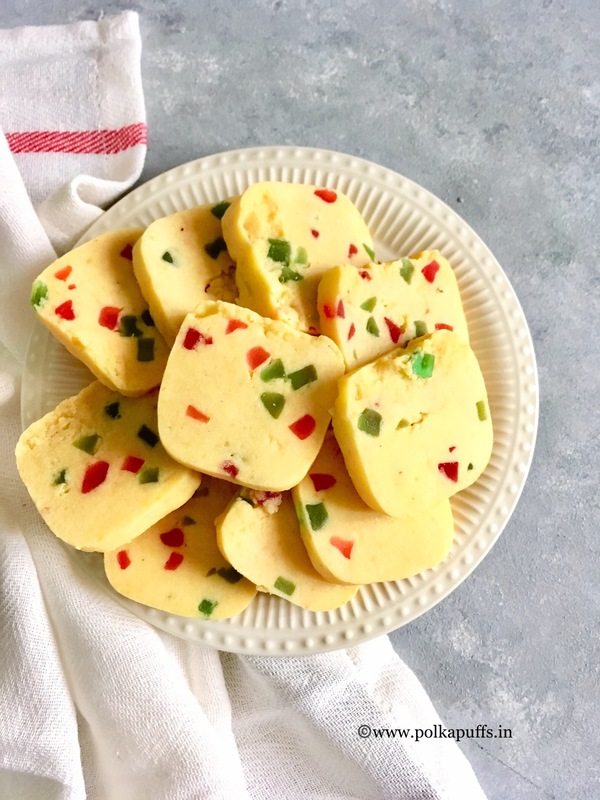 Butter – use a good quality unsalted butter. Do not whip the butter and sugar more than necessary and incorporate unnecessary air into it. We do not want the cookies to rise. Hence, just mix the butter and sugar just enough until they have incorporated with each other. 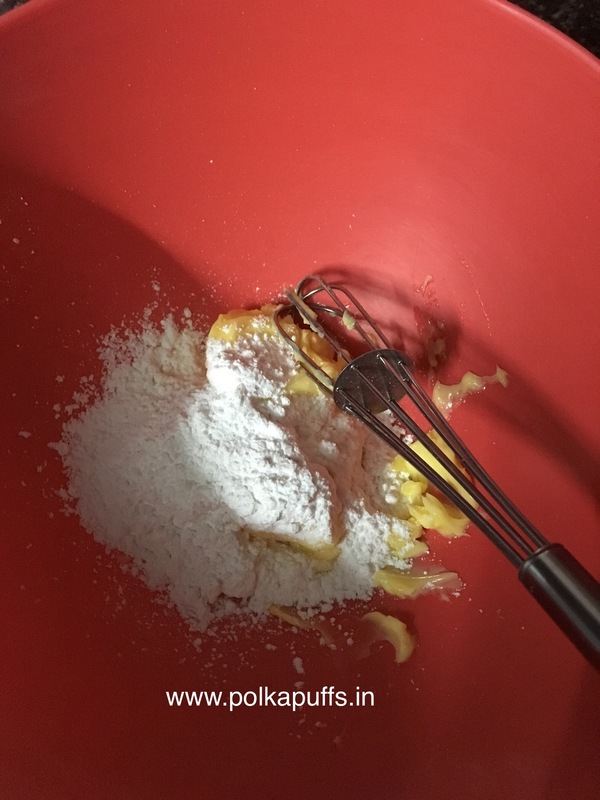 Sugar – In my learnings, trial and errors, I’ve come to the conclusion that using icing sugar in most recipes that clearly call for powdered sugar works better than regular powdered sugar or superfine casting sugar. The reason is that the superfine sugar melts quickly and that cause the cookies to spread. Thus, I use icing sugar in most recipes. Baking sheet – Never butter the baking sheet. Line it with greaseproof parchment paper or even silicon sheet. This ensures that the minimum grease because grease causes the cookies to spread quickly. Chill – Anything that contains butter and stays at room temperature is going to melt and spread around when in contact of heat. It’s always advisable to chill the cookie dough (like bourbon biscuits) or the log (in case of slice and bake cookies) thoroughly before baking. The longer you can chill, the better! Even if they are cut out cookies like sugar cookies, please chill them for 3-4 hours after cutting them out and before baking them. 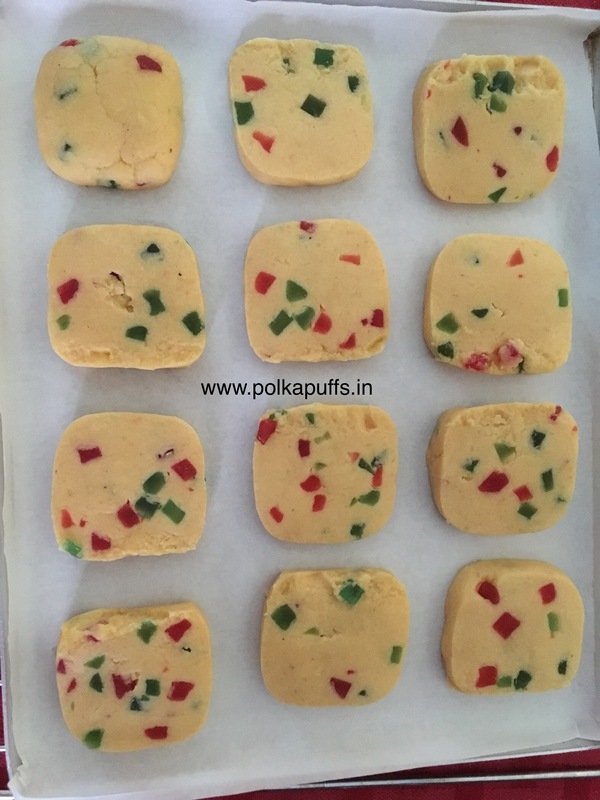 Temperature – Preheat the oven at a good, high temperature because that high temperature ensures that the cookies sets in the first 5 minutes of the baking time and spreads less while baking. 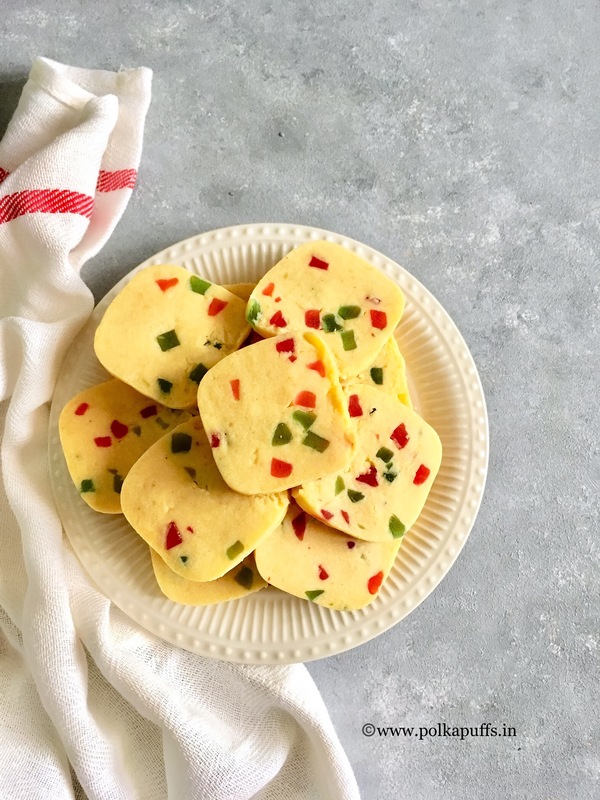 The reason is that, when the oven is set at a lower temperature to preheat and bake, this low temperature gives the butter in the cookies a longer time to melt and spread in the oven. Measuring the ingredients – This is very crucial. Ingredients must be measured correctly for the best results. One can’t blame a recipe if the ingredients aren’t measured correctly. I use a weighing scale when necessary or standard measuring cups when the recipe specifies ingredients in cups. Keep a set of measuring spoons handy for ingredients like baking powder, soda, etc. which can actually make or break any recipe! I believe these tips should tide you over as they have helped me too. It is inevitable that in the initials days of baking cookies, they may spread. That mustn’t scare you or put you off. Invest in good quality parchment paper, baking sheets and most importantly – ingredients. Buy quality ingredients as they will disappoint you far fewer times in your attempts to bake. Measure and set aside the flour, custard powder and the cardamom powder. Take butter and sugar in a mixing bowl, cream them together just until they are mixed together. Do not over beat them to incorporate ant air into these ingredients. Then add the Tutti Frutti and vanilla extract. Mix it these well then add the flour. Mix them well with a light hand and bring them together to make a ball. Use 1-2 tbsp. of milk only if you are unable to make a round ball. The dough doesn’t need to be kneaded, just bring it together. The mixture is very soft and pliable. Now, take the dough on some cling wrap and roll it well to give it the shape of a thick log. Wrap the log well and refrigerate for a minimum of 2 hours. I refrigerated the log for about 48 hours. In the meantime, preheat your oven @165’C for about 10 minutes. Line your baking tray with some parchment paper. Remove the chilled log of dough from the refrigerator and cut it in about 1/4th inch slices. Place them slightly apart on the lined baking tray. Bake them for 12-15 minutes @165’C using the lower rods. Remove the tray from the oven & let it cool on the baking tray itself for about 15 minutes, then cool the cookies on a cooling rack until they are completely cooled. The cookies are soft when you remove them from the oven but they crisp up as they cool down. You can store these in airtight containers for 2-3 days. Karachi Bakery Style fruit biscuits are egg free, crumbly, crisp and absolutely melt in the mouth! The best accompaniment to your tea or coffee that are generously dotted with candied fruits. The dough doesn't need to be kneaded, just bring it together. The mixture is very soft and pliable. In the meantime, preheat your oven @165'C for about 10 minutes. Place them slightly apart on the lined baking tray. Bake them for 12-15 minutes @165'C using the lower rods. Please note that baking time may vary as every oven is different, so time the oven accordingly. The cookies turn slightly golden around the edges as they are ready, so remove them from the oven as per the color. Its a very straightforward cookie to put together…slightly fudgy & chewy…oats give that lovely texture…and peanut butter makes it so morish😋… but it’s not crunchy as it’s not baked! It can make a great gift for friends & family too😀 🎁 or a Christmas project for your kids! Equipment: a saucepan, measuring cups/ spoons, a plate/ tray, a spatula. In a saucepan, add milk, sugar, cocoa pwd & butter. Cook these together on medium flame until the sugar melts and ip the mixture comes to a boil. Let it boil for just 1 min. Turn off the flame, cool it for 2 mins. Then add the vanilla extract, peanut butter & oats. Mix everything well. Then take a steel plate/ tray, and take some mixture in your palms and give it any shape of your choice. You can store it in the refrigerator for upto a week. And if it’s cold enough in your part of the world, you can just keep them at room temperature too! Let the festive spirit set in with these little bites of heaven! Adapted from Family Food Fun. I don’t think there is anybody who doesn’t like ‘Garama-Garam Samosas’!! ❤️❤️…my personal favourite among all the ‘desi’ snacks!! Equipment: a wok, a pan, rolling pin, measuring cups/ spoons, a slotted ladle, extra spoons & plates as needed, a pressure cooker. Mix all the ingredients except the water in a bowl. Rub the ghee with the Maida for at least 10 mins as this gives very good, flaky samosa. The texture will resemble breadcrumbs. Then add little water at a time and make a semi-stiff dough. Let it sit let for a minimum of 30 mins. 1 tsp each of coriander pwd, cumin pwd (Jeera pwd), red chilly pwd, Garam masala. Heat oil in a pan, add hing & cumin seeds. Once they splatter, then add the potatoes and green peas. Sauté for 5 mins. Then add the dry masalas and season with salt. Cook for 5 mins. Turn off the flame. Add coriander leaves & mix well. Let the stuffing cool completely before proceeding ahead. Make a lemon sized ball of the dough…divide the dough similarly. Now roll each ball to a thickness of about 3mm. Not more. Cut the the rolled dough into two half circles. Make a cone of each half. Seal it carefully. Add the stuffing into the cone…about 1 tbsp in each cone or little more. Then close the third side of the cone well. Use some water to seal the dough well. Repeat for all the dough. Keep aside for 20 mins before frying them. Next, heat enough oil in a wok to fry the samosas. Once the oil is hot enough, reduce the flame and drop 2-3 samosas into the oil. Deep fry them at low flame to get crispy & well cooked samosas. Soak the chickpeas for 5-6 hours. Then add the soaked chickpeas in a pressure cooker with some salt & 3 cups of water. Cook for 4-5 whistles. Let the steam release on its own. Then add the other masalas mentioned above and mix well. That’s it. Do check out authentic Litti Chokha too! 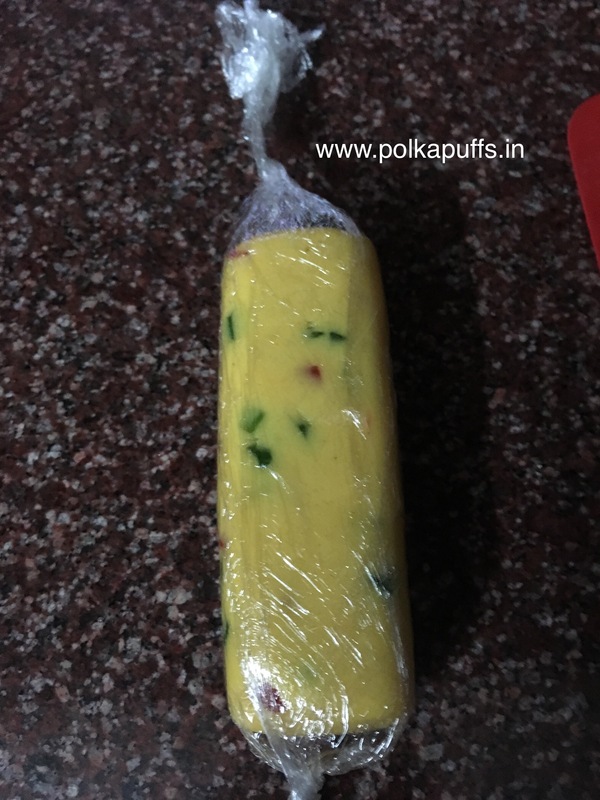 I remember visiting my Grandma’s place during winters…sitting On the terrace and enjoying the chilly weather while my Granny and my aunts would make these yummy Littis and Chokha..so warm and full of flavour! These recipes have been in my family for ages and are passed on to every generation! Although the recipe is pretty much the same in every family in the region. Here’s my Mother’s recipe which she learnt from her Mother..my Granny😘 …I am sure you will love it. Equipment: a large mixing bowl, measuring cups/ spoons, 3-4 extra mixing bowls, ladles and spatulas, a pair of tongs, a wired roasting rack, a baking tray, a cooling rack. 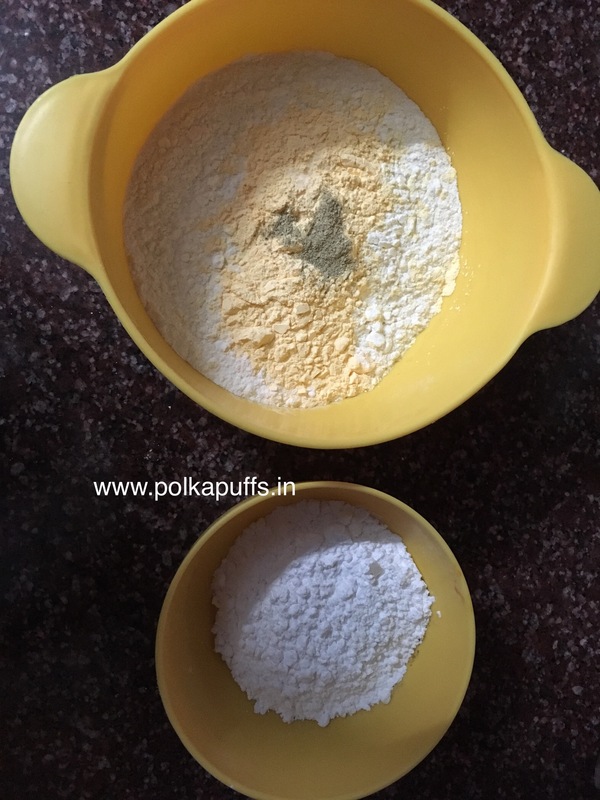 Take all the dry ingredients in a mixing bowl, add the ghee and mix everything well. Then using little water at a time, make a semi stuff dough. Cover it and set it aside while we continue with the stuffing. Mix all the above ingredients well in a bowl. Set it aside for the sattu to absorb the flavours. Divide the dough in equal parts. Flatten each part a bit and fill a tbsp orso of the filling like we do for Parathas. Make sure the outer layer isn’t too thick else it won’t cook through. Seal the Litti well. Repeat for the entire batch of dough. Set the stuffed Litti aside. You can cook them in a Tandoor. But I do it this way…check the below pic…it’s self explanatory. Cook all the Littis this way on each side for about 4-5 mins in low flame. Mix all the above ingredients in a mixing bowl. Set it aside. It’s always served at room temperature. Not hot. You can roast the tomatoes in the tandoor or open flame (my mom does it on an open flame). I do it in the oven, so preheat the oven to 200’c. Prick the tomatoes a few times, apply oil on them ..do the same with one green chilli too. Place these on a greased or foil lined baking tray. Bake for 35 mins using both upper and lower heating coils/ rods at 200’c. Grind all the ingredients in a blender, except the lemon juice. Add the juice post the chutney is ready. Mix well. That’s it!